Improve productivity, quality, and safety with Jaygo Filtration Systems. 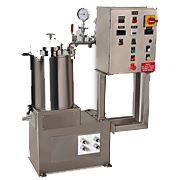 These systems offer complete product containment and solvent recovery to the user. The Altern Mill is uniquely designed, offering a patented grinding chamber and disperser/mill combination for "Super-Fine" grinding. This allows for simple cleaning between formulations, saving time and money. 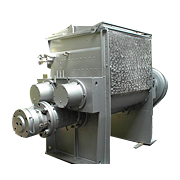 The Mill can be fabricated in stainless steel or special steel alloys. The unique properties of the Ball Segment Valves are that it can handle both liquid and dry abrasive products from fine powder to course abrasives. It has an opening where materials cannot build up, accumulate, or be captured within the valve body. 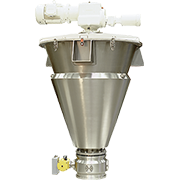 Jaygo Saturn conical processors are used as mixers, blenders, homogenizers, reaction vessels, vacuum dryers and live storage hoppers. 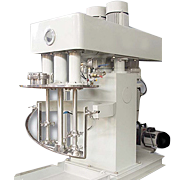 Jaygo is a supplier of high quality Double Arm Mixers and Mixer Extruders designed to mix, blend, disperse, and knead high and very high viscosity products. 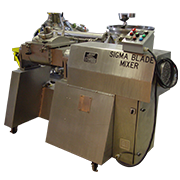 Double Arm Mixers include two mixing blades, normally "Sigma" shaped, but also available in "Dispersion", or "Double Nobbin" shapes. 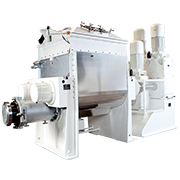 Jaygo's Mixer Extruders include an extrusion screw located in the bottom of the mixing chamber that operates in reverse during the mixing cycle, aiding the mixing blades slightly. The extrusion screw direction is then reversed after mixing, allowing the extrusion screw to discharge the product. Various shaped dies may be added to the end of the extrusion barrel, enhancing the versatility of the equipment. 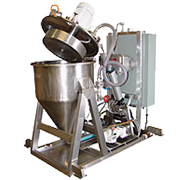 Jaygo's Double Planetary & Multi-Shaft Mixers are typically used in kneading mixing, blending, dispersing, and drying applications. 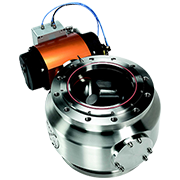 These mixers can be used with products of low to high viscosity, for a wide range of industries. The Jaygo Double Ribbon Blender is a horizontal mixer/blender for a wide variety of dry, liquid or slurried products. These versatile mixers are efficient and economical. Designs are available for both the Chemical industry and also the sanitary requirements of the Food and Pharmaceutical industries. USDA and 3A DAIRY accepted designs. 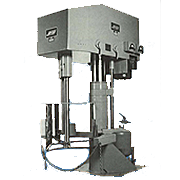 The Jaygo Model DSVS Dual Shaft Variable Speed disperser is designed to disperse heavy viscous paste products. 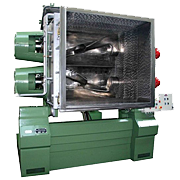 The unit has both a heavy duty mixing blade and high speed high shear dispersing blade. The heavy duty blade is designed to fit the diameter of the container. This allows the blade to pull the material from the container wall as the blade rotates. Jaygo's equipment rental program makes quality equipment available to customers that do not have the need or capitol to purchase equipment. We also rent equipment to customers while Jaygo builds custom process equipment. Use of the proper grinding media in high speed mill operation is of the utmost importance. The product being milled should determine the most desirable properties required of your grinding media. 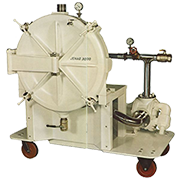 Jenag strainers have been designed to give a combined straining and pumping system in one compact and mobile unit. 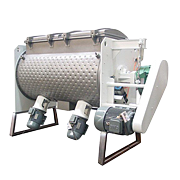 They provide a totally enclosed, self-cleaning system for the removal of over-sized particles from a wide range of liquid products. They can be used as individual units for batch production or built into a production system for continuous, automatic operation. Jaygo's new Multi-Shaft Mixers are robust, heavy-duty mixing machines designed for the production of a multitude of products. Through the guidance of Jaygo's sales team, customers can select equipment from a variety of agitator shapes and sizes designed to emulsify, disperse, and mix all types of products. Free flowing or wet powders can also be mixed, granulated, and dried utilizing various blade options. Typical product viscosities range from 1 cps to approximately 750,000 centipoises. 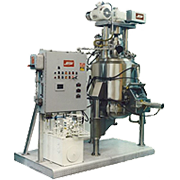 Jaygo's JTB BLENDER can be utilized for blending dry, powdery, granular, fibrous, and moist solids and liquids together with pasty products up to and including highly viscous masses. 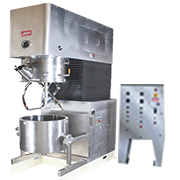 The JAYGO JTB MIXER can be used for numerous processes, including compounding, fine mixing, dispersing, suspending,emulsifyng, deaerating, tempering, accelerating chemical or physical reactions, granulating, breaking down agglomerates,etc. Jaygo carries a full line of pressure vessels clamps designed to work with ASME code pressure vessels. 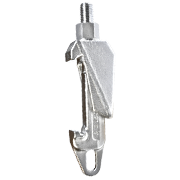 Our quick release pressure vessel clamps eliminate the need to drill holes in the flange of the vessel, eliminating the stress concentrations at the bolt holes. 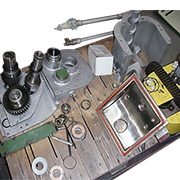 Jaygo offers comprehensive process equipment parts and service on our extensive line of equipment as well as our competitors' equipment. 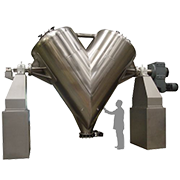 Highly viscous products are accurately packed by the unit's volumetric proportioner. Portion sizes are controlled, readily adjustable, and protected from over or under filling. 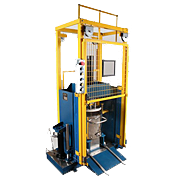 The hydraulic operated press easily packs your product into cans or cartridges. With Jaygo rebuilt/repaired processing equipment, you can be sure of performance and budget prices. Your equipment will be disassembled, cleaned and inspected. Worn or damaged parts are replaced or restored to original specifications. The reassembled equipment is then thoroughly tested before it is returned to you. Jaygo offers professionally rebuilt and refurbished process equipment such as mixers, blenders, deaerators, strainers, dryers, and much more. We not only refurbish our own product lines, but can repair and rebuild competitors machines as well. 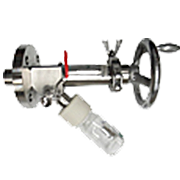 The Sampling valve allows taking samples of chemicals or pharmaceuticals (liquids, powders, suspensions) from process vessels and reactors. Jaygo Vee Blenders and Double Cone Blenders provide gentle high-flow mixing for solids/solids blends in a proportion of up to 1:100.000 with the possibility of using an intensifier bar to enhance the mixture, and solids/liquids in powder or granulate form with different specific weights. 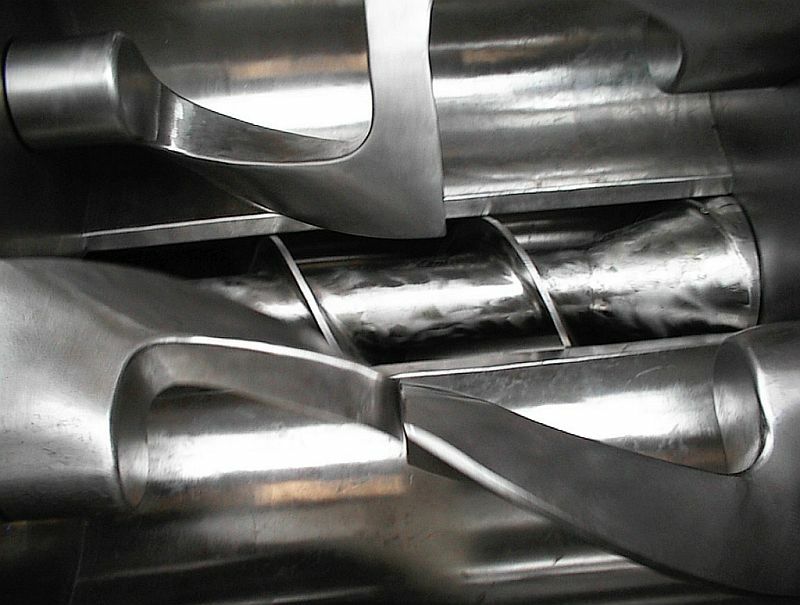 Due to the characteristic shapes formed by two normally identical sections joined at a specific angle, axial flows are created inside which separate and join the product to be mixed, and which together with the radial action of the mixture, results in a rapid and uniform process without the use of deflecting blades or other mechanical devices. Processing of liquid products often incorporates air and unwanted gases into the product. These gases normally cause problems such as oxidation, discoloration, inconsistency and filling difficulties. 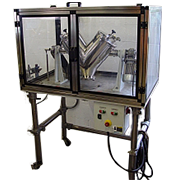 Our mixing, blending, drying and dispersion equipment, is available in either standard or custom designs, to meet your specific processing needs. The company has a world class reputation for innovative engineering, superb construction and fast delivery. Conical Screw Blenders snack foods, nutritional bars, cake mixes, pet foods. Double Arm Mixer- chewing gum, cookie dough, candy re-work, energy bars. Turbulent Blenders - powdered drink mixes, powdered food coatings, breakfast cereals, artificial sweeteners. Altern Mill - lipstick, cover-up, liquid foundation, body make-upMulti-Shaft Mixers - shampoo, conditioner, hair gel, body lotion, lip balmDouble Planetary Mixers - mascara, mud masks, facial scrubNovamix Granulator - blush, eye shadow, face powderVee Blender - scented powders, foundation, powdered concealers. Double Arm Sigma Blade Mixers - pigment salt grinds, ink flushesMulti-Shaft Mixers - polyurethane, pigment dispersions, dyesAltern Mill -artists paintsDouble Planetary Mixers - resins, plastisol, silicone. We manufacture, import and sell some of the finest processing equipment produced in the world. This equipment includes Conical Screw Processors, Double Arm Sigma Blade Mixers & Extruder Mixers, High Shear Mixers, Planetary Mixers and Grinding Media, Pressure Vessel Clamps and other Process Equipment. 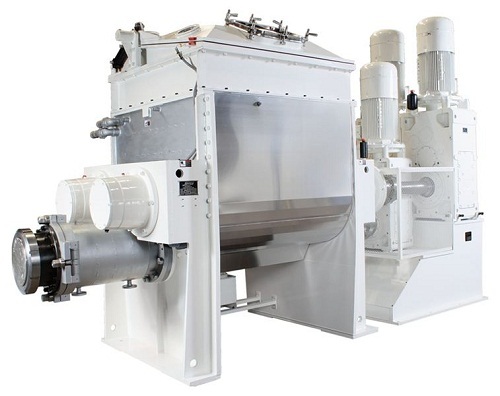 Jaygo’s new Double Arm Mixer Extruders are robust, heavy-duty mixing machines designed for the production of high and very high viscosity products from 1,000,000 to 10,000,000 centipoises and beyond. Jaygo mixers offer process flexibility, user friendliness, and easy to clean / maintain designs. The mixers are available in many sizes from 5 to 9000 liters working capacity and can offer a multitude of options. 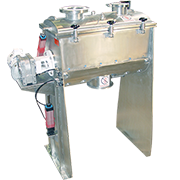 Jaygo’s Mixer Extruders include an extrusion screw located in the bottom of the mixing chamber that operates in reverse during the mixing cycle, aiding the mixing blades slightly. The extrusion screw direction is then reversed after mixing, allowing the extrusion screw to discharge the product. Various shaped dies may be added to the end of the extrusion barrel, enhancing the versatility of the equipment.